With Aetna Mobile, your health care is always at your fingertips. You can look up the status of a claim while at your doctor's office. 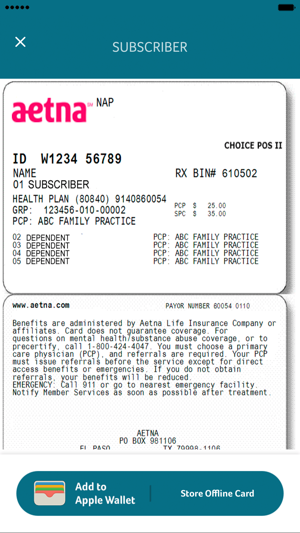 Forgot your Aetna ID card? No problem. Show the staff your virtual card right on your phone. This feature uses your GPS function to help you no matter where you are ― at home or at work, while traveling for vacation or business. A map provides turn-by-turn directions. Searching on Aetna Mobile is easier and faster than ever. Type your search -- just like you do with your favorite search engine. You can also enter locations like “near me” or a zip code to use your smartphone’s GPS. See your most recent claims. Get a detailed view of each one. Or search for medical, dental and pharmacy claims by member name or date. View the front and back of your ID cards. That's handy if you forgot your card. If your plan offers a personal health record, you can view your Alerts & Reminders, Emergency Information and Medications. And share data with your health care team. Aetna Mobile now comes with WorkAbility®. If you have Aetna Disability, you can view the status of your claims and the benefit payments issued on your disability claims. View limits and balances for your deductible and coinsurance. View balances for your health expense funds. You must always sign in with your User Name and Password. No one but you can reach your personal data. And once a year we need you to confirm your profile. If your app says it's time to update, log in to the secure site using your computer or mobile web. 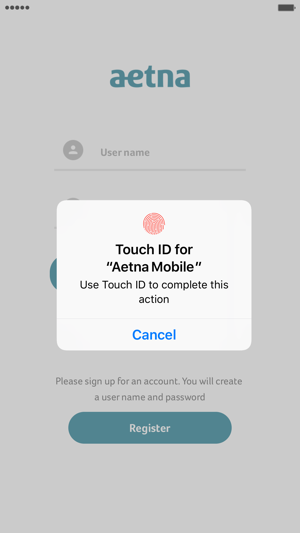 After you confirm, you can once again access your secure, personal info ― from your computer, Aetna mobile, and this app. Can't access all the app's features? Is the health plan under your name? (Meaning you are the subscriber or primary account holder.) If so, you can access all the features your plan allows. If you are a dependent, you will have limited access, just like you do when using the secure site on a computer or via mobile web. Aetna is one of the nation's leading diversified health care benefits companies, serving more than 35 million people with information and resources to help them make better informed decisions about their health care. For more information, see www.aetna.com. 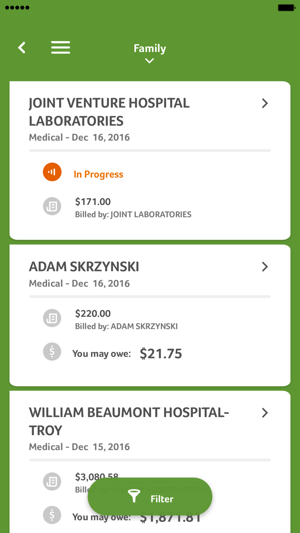 The Aetna Mobile app is compatible with iPhone®, iPod® touch, and iPad® mobile digital devices. We are listening to your feedback. It won’t let you paste your password into the login form, so if you use a secure password manager like LastPass, you cannot log in. For some reason, banks and insurance companies think that disabling paste is a “security feature.” It’s not. If you switch between apps to try to see your password and type it in manually, every time you switch back to the Aetna app, it deletes everything you’ve typed. So if you can’t memorize your whole password and type it in all at once, you cannot log in. I tried to type feedback into their feedback form, but that didn’t work either! It wouldn’t let me enter text into the form. This app is unusable. As soon as I submit this review, I’m going to delete the app. 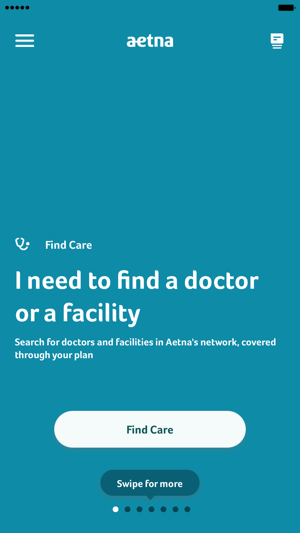 The app's "find care" feature is somehow totally disconnected from Aetna's website search feature, as I found absolutely awful results on the app but found great results on the website. 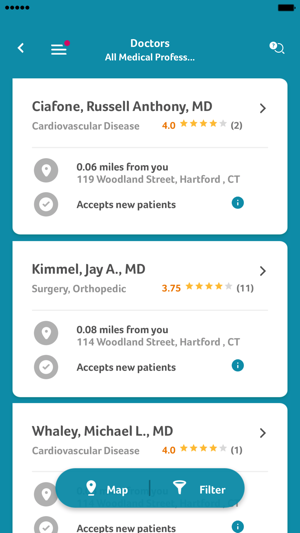 Reviews on doctors and practices help a lot but sadly a lot of the ones in my area have terrible reviews- not the apps fault though. I just can't seem to find a simple therapist for depression using this app, please update/fix the "find care" feature. Also when I typed in "therapist" it forced me to select either "massage therapist", "physical therapist", or "occupational therapist" which is annoying, so I selected "occupational therapist" but then i couldn't narrow it down any further? Like I need a therapist for depression but I wasn't able to search specifically for that? Please fix. This app - WHEN it works - is great! Well organized (still needs more data features added!) and can quickly tell you the status of a claim. LOVE the quick, color pages/by category! That said, it often crashes on an iOS (8 and 6), and the fingerprint login stops working if they have done an “update” - or stops working randomly for no reason at all. WORST OF ALL - cannot reinstate fingerprint login (have to MANUALLY LOGIN EVERY TIME! ), unless you completely delete app and then re-install. Better than being told by Aetna “Customer Service” to NOT USE a mobile device (?!?!) and use a laptop to be able to login. Please HIRE more IT staff. Sounds like they are overworked! © 2019 Aetna Inc. All rights reserved.